Find hotel near Virtual Aviation Flight T ..
As small children, many of us harbour ambitions of sprouting wings and soaring between the clouds. As we grow a little older and reality hits us, we compromise and decide that manning a spaceship or a helicopter is perfectly fine for us. Most of us forgot these dreams of taking flight but now, there is a way to live them out, and at any age! We can finally soar in the wild, blue yonder without having to worry about the hard, brown down under! Cambridge’s airport is probably one of the only in the world that has an intriguing sight to see within its confines. At Gate E, there lies Virtual Aviation's new Boeing 737 flight simulator. With its intensely realistic graphics, accurately detailed cockpit and a host of real life pilots to take you through the ropes, the multi-million pound flight simulator is the stuff of dreams. It’s normally used for training airline pilots but if you book in advance, you can get yourself a seat behind the wheel and take off! It’s more than just a simulator, it’s a whole body experience. Our eyes are responsible for a large portion of our sense of balance and watching the screen till from side to side is enough to make anyone feel a little anxious. Though you can’t crash the plane, you really do feel like you’re manoeuvring it thought the sky. With simulated routes from Stansted to Heathrow, St Moritz to Innsbruck and a lap of Tobago, each with vivid detailing, it’s no wonder that people are willing to spend money on this adrenaline pumping ride. 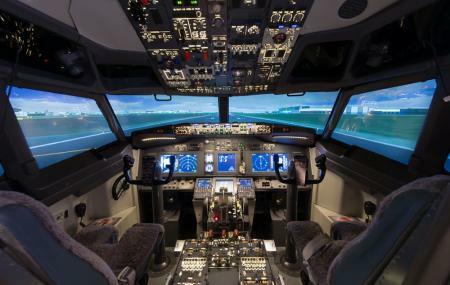 If you’re an aviation student, work in the industry or an aviation buff, then this simulator is a dream come true. It’s also a good way to keep the kinds busy while waiting for your flight back home. It’s an ideal present for the hard-to-buy-for person who has everything, and open-dated gift vouchers are available. The simulator features a whole-earth 3D wrap around visual system. So you can take off from London on a freezing winter morning with blowing snow, then descend through the clouds and land in Hong Kong at sunset. You have to book in advance, please call before visiting. By Train: Cambridge rail station is located just three miles from the airport approximately a 15 minute taxi journey. By Bus: The bus stop is located just walk from the terminal on Newmarket Road. How popular is Virtual Aviation Flight Training Centre? People normally club together Anglesey Abbey and Arts Picturehouse while planning their visit to Virtual Aviation Flight Training Centre.